Home/Interior Design/Which rug is best for your home? The rug you choose can change the look and feel of your home, but it can also do so much more. Your choice of rug can have a major impact on the environment and even your own physical health, so it’s a much more complex decision than simply choosing the colors. Of course, you need to consider the color scheme. There’s nothing worse than an accent touch that simply clashes with the room it’s meant to complement. Wool is by far the most popular option for a premium rug, especially for high-traffic areas like your living room. A wool rug will look good, feel warm and cozy under your feet, and it will stand the test of time. Wool is also a natural, non-allergic fiber that is largely resistant to dust mites and bacteria. It’s made from natural materials that will biodegrade, and the environmental impact is low. You need to keep it clean because the fibers can trap dust and hairs that can then agitate allergies. The material itself, though, is relatively benign, stain resistant and water-repellent. Be aware that a wool rug is a big investment and if you change your décor, you might not get the best years out of it. A good wool rug can last 50 years, but fashions will change in the meantime. Silk and viscose rugs tend to be much more delicate. They can show footprints, and they need to be professionally cleaned. They have vibrant colors and fine details, so they’re a tempting alternative to wool for low-traffic areas like your bedroom. You can opt for a smaller rug, which means the cost isn’t so much of an issue. Cotton rugs are much cheaper and tend to look it. The classic dhurries and kilims are ideal floor covers for kitchens, play areas and high-traffic areas where you get frequent spills. The main advantage, aside from the price, is that you can simply wash a cotton rug. Sisal, Jute or Seagrass rugs are a totally different proposition. They generally come in earthy, natural tones, which means you can pair them with almost any color scheme. They’re seriously durable, too, and tend not to fade in the light. So, they’re ideal for conservatories and high-traffic areas of your home, especially near entrances to muddy gardens. Beware, though, they can be tricky to clean, and you might find yourself replacing them rather than trying to freshen them up. Of course, you can opt for a synthetic rug, and they’re getting better all the time. You can choose from almost any finish, from a passable wool substitute to fake animal hide and even outlandish options that are clearly man-made. 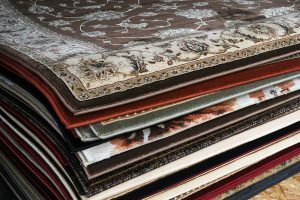 Synthetic rugs tend to be much cheaper, although you can still spend big on a premium rug. They are easy to clean, water resistant and family-friendly. They are not particularly kind to the environment, however, as the plastics have to be manufactured and the rug will not biodegrade. They can also, on occasion, give off gases as a result of the manufacturing process. It’s rare, but this has been known to cause reactions. Natural animal pelts are going out of fashion, as most consumers simply don’t want an animal skin on their floors. They also smell and do require maintenance, whereas a synthetic version can be almost indistinguishable and you really don’t need to worry about shedding or feeling bad for the animal. So that’s a brief introduction to the type of rugs that can bring a splash of color to your home and tie a whole room together. Hopefully, you’re feeling inspired — now it’s time to go shopping!